Riding high on her professional life with the success of her shows, good news came in heaps and bounty for the producer-director of the industry, Ekta with the arrival of her little bundle of joy, her first child, Ravie Kapoor, born to her through surrogacy. The Kapoor clan in on cloud nine ever since the arrival of Ravie and they left no stone unturned to celebrate this momentous moment. 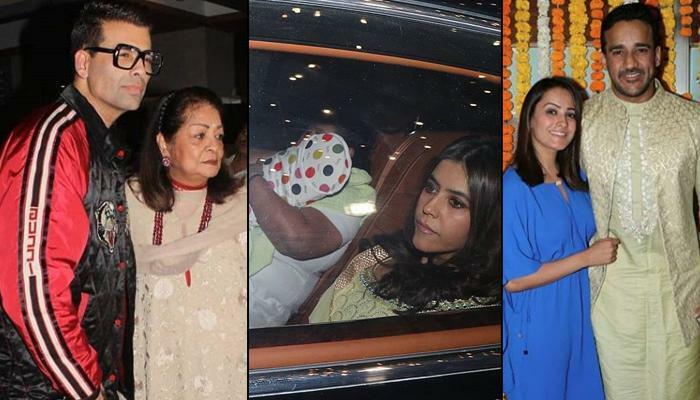 On February 11, 2019, Ekta Kapoor hosted a naamkaran ceremony of the junior Kapoor in the house and who’s who from the industry came to bless the newborn. The family members, Jeetendra, Shobha Kapoor, Tusshar Kapoor and his son Laksshya were spotted at the venue. The ‘big brother’, Laksshya looked cute as a button in a yellow kurta and white pyjama. The newbie mommy, Ekta glowed in a stunning light yellow sharara. Celebrities including Karan Johar, Shweta Bachchan Nanda, Abhishek Bachchan, Hiroo Johar, Smriti Irani, Farah Khan, Shamita Shetty, Urvashi Sharma, Urvashi Dholakia, Divya Dutta, Rahul Bose, Mona Singh, Krystle D'Souza, Pragya Yadav, Sakshi Tanwar, Shabir Ahluwalia, Kanchi Kaul, Mouni Roy, Hiten Tejwani, Swara Bhasker, Huma Qureshi, Anita Hassanandani, Rohit Reddy, Divyanka Tripathi Dahiya, Vivek Dahiya, Rhea Kapoor, Karan Patel, Ankita Bhargava amongst others graced the ceremony.